At the age of 18, while in university, Nasimah and her friends explored questions like Why am I on this earth?, Does my life have meaning? , What happens after death? Despite the very positive aspects of Nasimah’s family life, school and sports, she still found emptiness in her soul. However she did not hear anyone speaking about Jesus as being more than a historical figure. Then, during the summer, Nasimah heard of Jesus in a new way. While visiting her family for two weeks, her older sister told her how Jesus had transformed her life. Nasimah saw that God’s love was shown to all people through Isa al-Masih (Jesus the Messiah). In late July of that year, Nasimah began top see how sinful she really was. With the help of her sister and al Ruh’allah (the Holy Spirit) she discovered the true life that comes when trusting in Jesus. Nasimah learned how Jesus died and rose for her. Death had been defeated by Jesus’ resurrection, and Nasimah’s fear of death was overcome. Nasimah finally found a reason for living; it was to serve the One who gave His life for her. New! 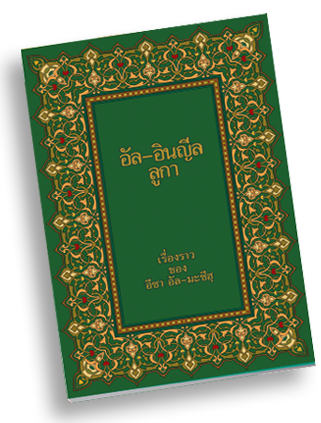 The Book of Luke (New Testament portion) in the Thai Muslim dialect is now available! Order it and read it yourself. You will learn more about the language that Muslims use, and you will be better equipped to share with your Muslim friends. Order for your Muslim friends or co-workers. They can read and understand the Gospel of Luke like never before due to the clear language and immense effort translators have put into every phrase. Simply fill out the form below. If you order 1 copy only, we will gladly offer it to you for free. If you would like to order 1 to 3 copies, there is a small charge. After you submit your order we will send you a link where you can pay/donate to help cover the book’s costs. If you would like to order more than 3 copies, please send us a message via the contact page.